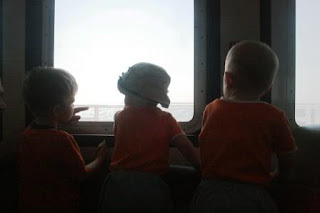 Two Bears Farm and the Three Cubs: Bald Head Island, Part II. Old Baldy. Bald Head Island, Part II. Old Baldy. 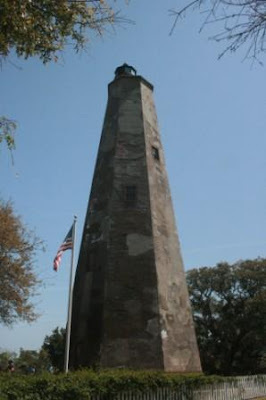 Old Baldy is the oldest lighthouse in North Carolina. Built in 1817 to light the mouth of the Cape Fear river back in the days of rogues and pirates, it has been a landmark ever since. 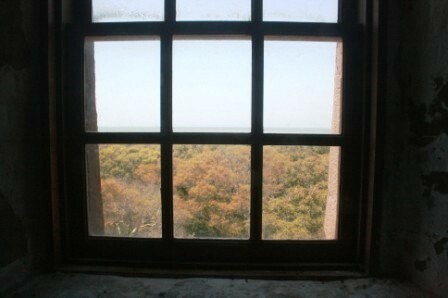 Old Baldy has been restored, and for $5 per adult and $3 per child, you can tour a small museum and go up in the actual lighthouse. And I do mean up. Over 100 stairs to climb! There are windows on the landings along the way, which offer spectacular views of the island. 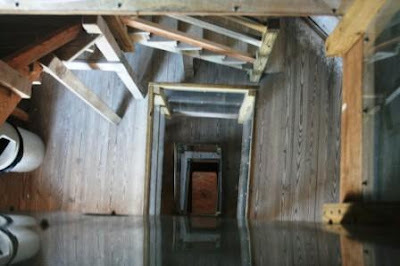 The higher up you go, the more narrow the stairs get. 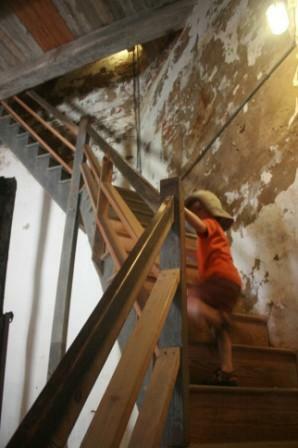 Until finally, all that is between you and the top is this steep little wooden ladder. 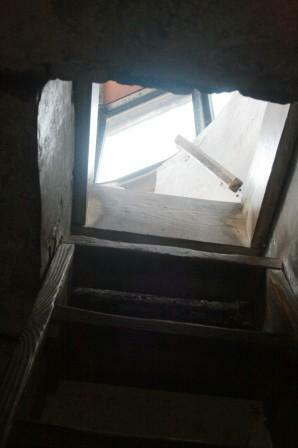 And then you can look back down through a hole in the center of the floor, and see all those stairs you just climbed! Dizzy yet? Once you admire the view from the top, you get to go back down. Pierce was a champ and did the whole thing with no help from me. Then we hiked halfway across the island to check out some shops and grab ice cream. Fun! I'll bet three little boys slept well after that adventure! you did make me a bit woozy with the downward-looking stair shot! Looks like the boys had a great time at the lighthouse. But they sure do look tired at the end. I love lighthouses. We have a view of one from our house - on the north-west tip of our island - officially the windiest place in the UK! Way to wear out the little ones! I bet you guys had a peaceful evening since I am sure the boys were sleeping quietly. I've heard of Cape fear, but never realized there was a lighthouse there. Thanks for the tour. I bet the view from the top was well worth the 100 stairs! I love family adventures like this one that your family had-fun times!! Oh gosh, I need a Dramimine!!! And once you get to the top, there's a HOLE in the middle of the floor??? Well, I have a fear of heights. I can't even go up on the Skyline Drive anymore. No guard rails!! You got really good pictures, though!! Not for the feint of heart. 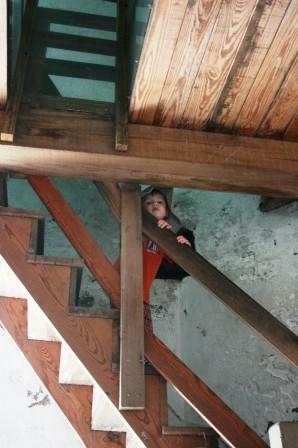 I love that picture of Pierce peeking over the handrail!! What did you do, tell him there was chocolate at the top?? Ha ha!! What a cutie!! Bald Head Island is one of my favorite places anywhere...I have something in common with it I think! Yeah for Pierce - I couldn't do it and I am a lot older. Looked like fun and I bet they were tired. What did the twins do? There's just something about lighthouses. I never get tired of seeing them, and I love to visit them. Thanks for sharing these peeks of your vacation; they're delightful! Looks like fun Lisa! I'd love to do it myself! Lighthouses just have a certain charm, don't they? Beautiful photos!